Download our FREE guide, “Six Tips to Optimize Content Marketing for Conversions” today. Content marketing across your website, email, Facebook, Google+ and more can fuel web traffic and leads, but 66 percent of marketers struggle to align content with a conversion funnel. How can you create and distribute content that will engage relevant audiences? What can you do to put content in the context of conversions so readers will take action on your site? 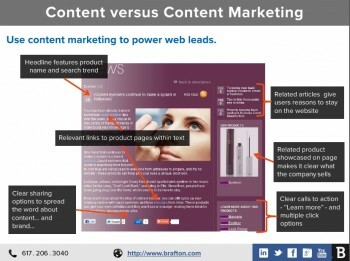 Brafton has given this presentation to marketing insiders at some of the biggest tradeshows in the industry. Take advantage of this opportunity to download the guide for free – and don’t hesitate to contact us if you’d like more information about custom content marketing strategies that can build conversions for your business.